Multitasking is an inevitable part of life. What most humans want is to do things and to do more of them. As we evolve from being a student to a team member to a team leader, our tasks become exponentially more complex and with higher stakes. The question rests, does this mean our mental capabilities become better at functioning as we wear multiple hats? Are we destined to evolve into high-functioning robots? Science says no. The reality is the human mind can only focus on one conscious pursuit at any given time, but multiple automatic activities, such as walking, talking, and eating, simultaneously. This is an intuitive assertion as we know that neurons in the brain decline after the peak years in early development. When we do more, we will do it but with less precision and accuracy. In summary, a multitasking human brain is a myth and not an evolutionary edge we have gained to glamorize our resumes. The art of multitasking can be described with two words: command and control. It’s clear that the human brain will never (update: anytime soon) have the capacity to encompass all surrounding information simultaneously. Our solution is technology. The human ability to quickly operate between multiple devices is a learned skill that gives an individual the unique edge against others. As with every skill, practice is imperative and discipline is key. Arm yourself but be limited to two devices and a few software tools. There’s no need to operate a computer, phone, and tablet simultaneously, this is a dangerous place for your executive system as it inhibits your ability to do more at the best quality. Make a plan. A simple checklist or diagram flow of events will help you see the big picture. It’s best to create a timeline of events as time is the easiest property to waste and the most difficult to regain. Clarity leads to direction. Prioritize the items in your plan and make it count. You have a team of devices, a great plan, and now all you need to do is execute. 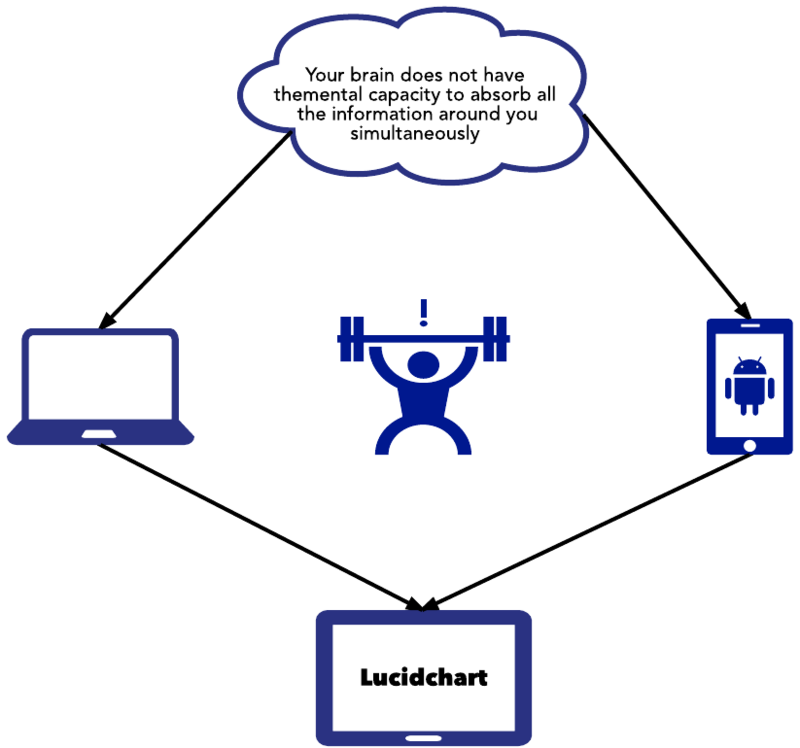 Try using Lucidchart, a free flowchart web app, to plan your day. Manage your sleep and food intake. Try to plan what you will eat every day and what time you will reserve to eat. You need energy to successfully execute your already perfectly crafted plan. This doesn’t mean you need to meal prep like a maniac on Sundays. Know ahead of time what days you will be going out for lunch with coworkers, and what days you’ll need to be prepared with a backup of snacks. Get enough sleep even if it seems impossible to do during the weekdays. Your brain will be thankful. The most important advice is to recognize when it is self-defeating to multitask. Learn when to compartmentalize the aspects of your life that should be dealt with by multitasking and when you should simply enjoy the moment. I'm a new graduate with a B.S. in Chemistry from the University of Utah and looking forward to going to graduate school in a few months. I've been at Lucid as a Product Support Specialist for 9 months and counting. Aside from work, I enjoy running, biking, fostering animals, and talking to my plants.